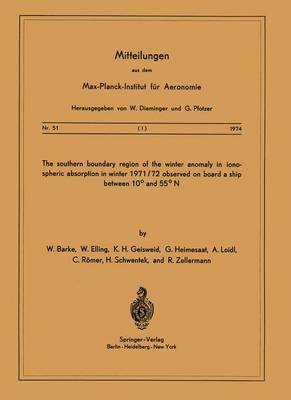 In the period 28 November 1971 to 12 February 1972. during three passages of the North Atlantic. the diurnal variation of ionospheric absorption L was measured by method Al at 1. 7 and 5. 0 MHz as a function of geographic and geomagnetic parameters. The measurements were carried out. applying a new equipment especially designed for mobile expeditions. on board a cargo vessel (mv "Hanau" of Hapag- 0 0 0 0 -Lloyd) moving between Hamburg (53 N; 10 E) and La Guaira (11 N; 67 W). Simultaneously. in the framework of the European Cooperation on Winter Anomaly studies. measurements of absorption were made at various other locations and the data used as a basis for comparison [circuits Norddeich-Lindau 0 0 0 0 (A3; 2. 61 MHz; 52. 6 N; 8. 7 E) and Aranjuez-Balerma (A3; 2. 83 MHz; 38. 6 N; 5. 2 W). station Lan- 0 0 caster (AI; 2. 14 MHz; 53 52' N; 2 45' W) 1 . Aboard. the diurnal variation of absorption showed large modifications from day to day. The behaviour of L (cos X = 0. 2) waS somewhat different at each passage 0 0 but showed a common trend: The winter anomaly vanished in a transit zone between 34 and 44 N cen- 0 tered at about 39 N; the same was true for the behaviour of L (cos X = 1).